Never in my entire life will I receive an overwhelming messages and inquiries when I decided to blast my announcement of finding a travel buddy. I totally lost count of all of them and never had a chance to reply one by one which I am truly sad. Most of them aren't really serious, just wanting to take the opportunity or mistakenly understood the message as an entire trip. 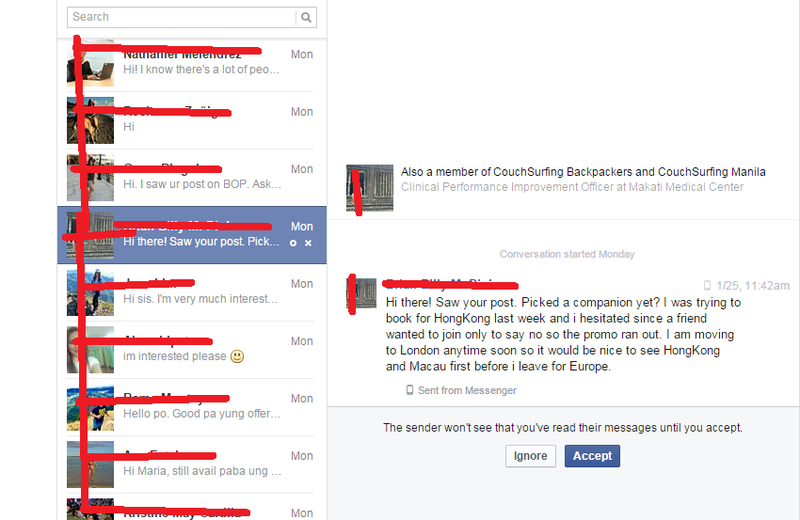 I wish I can screenshot all of them from different FB travel groups to private messages, I am really blown away. In the end I finally sort things out so I am very happy to tell that it is my Mom whom I will be with. I first tried to message those who were so fast to get in touch with me but most of them doesn't have the money RIGHT AWAY that I need to claim the roundtrip flight tickets. The next thing that I need to accomplish is have my mom renew her passport of ten years that she has never used. "Like you, I also love travelling on a budget. I have been to cambodia-vietnam-thailand.Singapore and Malaysia. I am not maarte and and always on the look out for freebies and discounts too :). what can i share? my stories about the places I've been over a bottle or a cup of your favorite drink.. Thanks!" "Can we do backpacking style :) instead of getting tour can we just DIY? It's my first time to travel out of the country just in case you will pick me,,, Actually i might be the one who will learned a lot from you.. im just starting travel 22 years old and aims to finish first the 81 province of the Philippines.. im not sure what i can give you an exchange maybe free dinner on the first night is on me! :)"
"Simple reason.. I love to travel! taking pictures and make new friends. I honestly going to HK this March 16-20. Just wanna try my luck. They say that travelling is sweeter the second time around. hahaha :P "
"please pick me cause ive always wanted to go to disneyland!! im married & has a 1y/o son! my husband encourage me to join so that i can have my "day-off" daw! hehe..im not maarte on foods! street foods are always one of my favorites! im not that rich, maybe we can be friends? hehe please please pick me!!!! than you so much!!! " "I've never been to HK and Macau and if ever you pick me it will be my first time to go abroad. I will like and share all your facebook post and repost your instagram pictures and best of all if you pick me I will share my trip to HK/Macau videos and pictures! #akonalangpoplease"
I'm interested to join. I'll be back from my Indochina Trip before the dates you mentioned on your blog. I'm from the BPO Industry and am currently on a break from work to travel as I start-up a travel agency. I'm doing my ocular trips and don't mind paying for the services as long as I feel those are reasonable. I'm after taking photos of destinations that we would offer in the future. I don't have a supplier yet for Hong Kong and Macau, but I can get a few in a week or two. At any case I think the two tours you noted on your blog are good deals as well. If you choose me, I'll treat you to a nice dinner at Harbour City (because I have a stationery shop that I'd like to visit there ;) Regardless of who you choose as your companion, I do hope you have a safe and enjoyable trip to HK and Macau! As a working student, as exchange for the free roundtrip flights maybe I can buy us food during one of our stays or I can pay for your travel tax. Most of all, I can share with you a very wonderful memory. Promise, I am very trustworthy and reliable ;)"
"Because I am an adventurous girl with a happy disposition. I am willing to share on the expenses if ever chosen and would love to experiment on various food finds and take awesome photos as well as have a great time :) "
"Its my birthday on march 29. im a fine arts student from up and it would be fun to get some inspiration/nice photos i can use as subjects for my painting, im a girl ive never been in a plane before i guess this is going to be fun hahahahahah and im nice and i wanna accompany you i know the feeling of going places without someone its fun but i think its better with someone yay see ya! Ps i love taking photos :D"
"Hi Rona! I saw your posts, I had been in HK and Macau before but i am planning to go back as I only have been t only few places such as Disneyland, The Peak, Mongkok area and only stayed few hours in Macau and visited Galaxy Hotel and the Venetian. It would be a great opportunity to meet other backpackers like you as I think you have been to many places than me.. I've seen the packages you have been eyeing for. It would be nice to go so zenschen as well. I wish to go back to HK again and see ICC tower also the 3rd tallest tower in the world I think. It was foggy when we were there so me and my friend had not a cchance to see it. If you pick me for this it owuld be aan honor I have bbutdget to go out and it's been 4 years that I have never been out yet. There are so many things I couldd share with you if yyou would pick me.. san. I hope this would suffice. Salamat"
"Hi Maria! I'm -------- from Cabanatuan City, Nueva Ecija. First off, let me cover your basic requirements. - I am definitely not maarte. I'm actually a Manilenya who chose to move to Nueva Ecija for work. (I go back to Manila every weekend though) I currently work for a research organization and my work requires extensive fieldwork within the province. I know how to take all modes of transport, and conduct interviews in really remote areas. I'm quite low-maintenance and I'm game for anything. - This is so me. I'm pretty OC when it comes to budgeting but I make sure to choose the most cost-efficient options during my trips. - I simply fit the bill, hahaha! 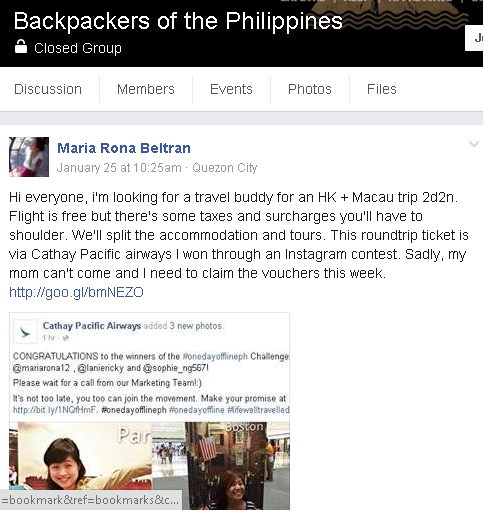 Now what can I share in exchange of a free roundtrip flight? - I have a genuinely happy disposition. Friends say I'm funny and I make really witty 'hirits' so I think more than anything, I'd be happy to share a lot of hearty laughs with you. - Nothing beats great conversations. I have very diverse interests and I'm passionate about the work I do. I have traveled to India, Thailand, Myanmar, Japan and Korea. I have never been to Hong Kong or Macau though so if you choose me, it would be a first for me! - I used to dance when I was in college. I'm part of the Company of Ateneo Dancers (CADs). I used to teach KPOP classes before it got big but even years after I graduated I still love to dance. Well, I guess that's all for now. I hope you find the right travel buddy! :)"
Yesterday I went to Cathay Pacific Airways Manila branch located in Makati which I am just a bus ride away. 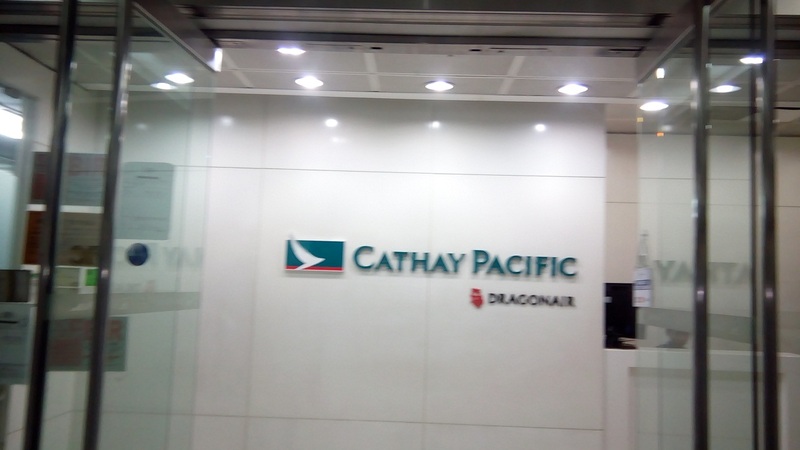 It is located in 22F LKG Tower 6801, Ayala Avenue, Makati City, Metro Manila. I had a great view of skyline along Ayala Ave where it is located. There was none who tackled about sharing the financial part which of course I have to admit that is the one that I am looking forward. If only this is entirely free trip, I will pick them all.